It’s been an entertaining pastime for some people reading Before Watchmen to look for continuity niggles. Would Comedian’s mugshot really be on Captain Metropolis’ wall before the Minutemen were formed? Why did the possibility that Comedian killed Kennedy have to be intentionally removed in The Comedian? That kind of thing. Well, they will have a field day with Before Watchmen: Dr Manhattan, published today. And yes, there will be spoilers. Not major ones, but some. You have been warned. More than any of the other books so far, Before Watchmen: Dr Manhattan by Joe Michael Straczynski and Adam Hughes retells scenes from the original, and then adds new experiences into those scenes. The walk on the moon with the dropped photograph, is especially revisited. But then things change. 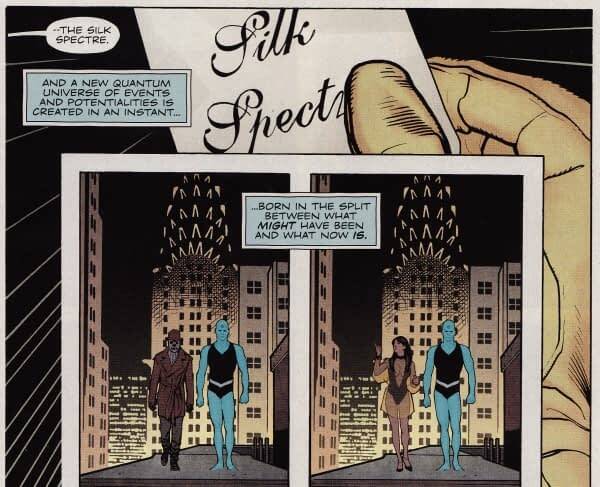 The original Watchmen presented the world of Dr Manhattan as one of clockwork – figuratively and literally, with references to Newtonian physics, even in the quantum mechanical world of his power base. Events happen one way, they have only happened one way, they only will happen one way, and Manhattan experiences them all, with cause and effect up the swannee. Indeed, he uses the event itself as justification for the event – this is how it always happened. But in Before Watchmen this is no longer the case. Manhattan can choose different routes, sees different moments of quantum singularity and choose different paths, rejecting one history for another, and we see the different routes play out, leading to a very different ending. Which feels like it will be all fixed and re-wrapped up by the end of the series, but we may see Sam Hamm‘s ending for his Watchmen movie script revisited here, before it all, well, gets put back in the box. There does seem to be a problem here though, and I want to talk about it. I may have to work this out as I go along, bear with me. Because that’s the thing. In Watchmen, Dr Manhattan is the most powerful person in the book. Yet his powers reflect those of the every day reader. He can read reality in any order he wishes, he can flip forward, he can flip back, he can see what happens next. Just like the reader can? Who watches the Watchmen? Well you do, and as an ordinary member of the public, you have the powers of a God when doing so. However, you can’t change things, Watchmen is a fixed text. For all its talk of quantum realities, it’s a clockwork world. 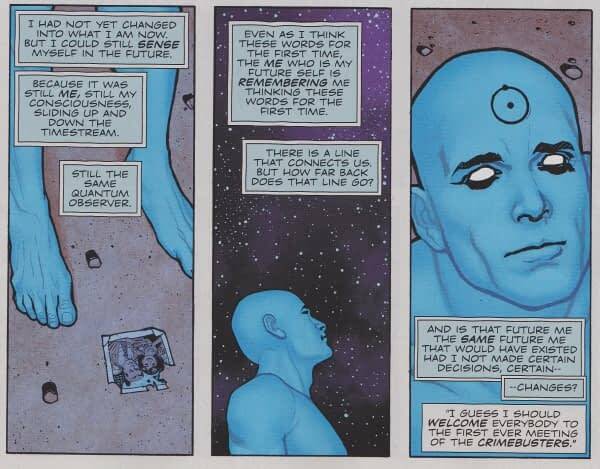 Before Watchmen: Dr Manhattan changes that experience at its fundamental core. Instead it has now become, for the character at least, a Steve Jackson Choose-Your-Own Adventure book… an experience that the reader is now divorced from, because we cannot do that. 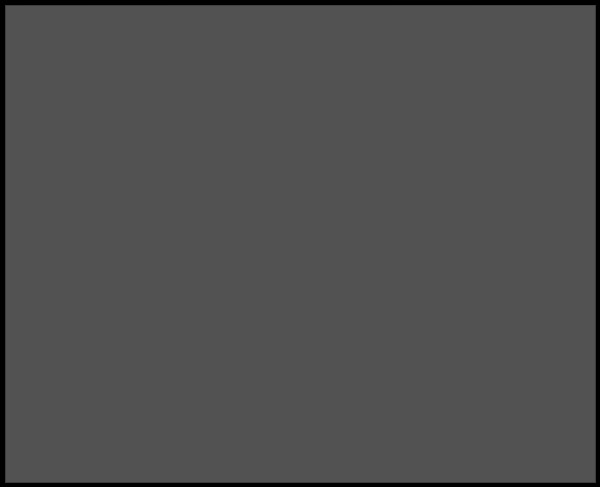 It also either makes a mockery of Manhattan’s claims about his ability to alter events in the original, or makes him out to be a liar. Which, you know, he has been. We just didn’t know he was lying about that too. Of course, in the original, he probably wasn’t. I guess it will get Star Trek Reset Button outed at the end, but even the possibility of this interpretation fights directly with one of the central aspects of the reading experience of the original. JMS walked off the final chapters of Amazing Spider-Man’s One More Day when Joe Quesada wouldn’t let him change the Spider-Man timeline, so that one action in the past had a radical effect on the character’s life, rewriting the Marvel Universe as it went. Could it be that he is finally getting his chance to do that, but with Watchmen? Also, I’m not happy with the Pseud-dinger’s Cat explanation at the beginning of the book, but that’s another post for another day. Before Watchmen: Minutemen is published by DC Comics today. Comics courtesy of Orbital Comics in London.